A guide incorporating a variety of Hobart hotels, motels and serviced apartments that are available at discount, budget rates. Budgetstay.Com.Au gives travellers the ability to book online directly with the confidence of knowing that they are getting the cheapest rates that are available for the hotels and apartments which are providing this quality Hobart accommodation. Centrally located in quaint, historic Battery Point, St Ives Apartments Hotel offers budget accommodation in the heart of Hobart's tourist centre. It lies only minutes away from Hobart's remarkable waterfront, the Botanic Gardens, the famous Salamanca Place and its exotic Saturday Salamanca Market. Mt Wellington, Wrest Point Casino, the Domain Tennis Centre and the Cadbury Chocolate Factory are just a short drive from St Ives. Book online now to enjoy our luxurious fully equipped 1& 2 bedroom and studio apartments in Battery Point. The Riverfront Motel accommodation has the major advantage of being within a 10 minute radius of Hobart's top attractions. With easy access to all of the major tourist attractions in the Hobart region the Riverfront Motel and Villas is the ideal place for your next budget accommodation. It also features numerous guest services and facilities including lounge bar, business centre, conference centre, faxing facilities, free car parking, guest laundry, restaurant, room service, outdoor swimming pool, tennis court, bbq facilities, landscaped garden and baby cots available for families. For a long time business and leisure travellers have been staying at the Riverfront Motel and Villas because of its unique home away from home feeling. Also the friendly and knowledgeable staff and excellent array of facilities at these Rosetta apartments will ensure that your stay in the city is completely trouble free. The accommodation at the Martin Cash Motel is conveniently located only 10 minutes North of the Hobart CBD in Glenorchy. This affordable Hobart motel is close to the Cadbury Chocolate Factory, Moorilla Estate Winery & Museum, various shopping districts and provides an excellent base from which to explore everything that Hobart & Southern Tasmania has to offer including the Salamanca Market, Hobart Docks, Port Arthur Historic Site, Richmond, Huon Valley & Mount Wellington. Ideally situated in a great city location the Martin Cash Motel is within easy reach of all the major attractions that Hobart has to offer. This along with the many guest facilities like business centre, faxing facilities, free car parking, guest laundry, room service, bbq, garden and daily housekeeping is what makes the Martin Cash Motel such a great place for a relaxing stay. With lots of interesting and exciting things to see and do in and around Hobart guests who choose to stay at this cheap Glenorchy accommodation will be well positioned to see them all. The Harringtons 102 is an modern tourist accommodation facility located in Hobart's central business district with easy access to the city and all major tourist attractions. It is also suited to the business person requiring accommodation close to the Hobart CBD. Ideally situated in a great city location the Harringtons 102 is within easy reach of all the major attractions that Hobart has to offer. This along with the many guest facilities like and is what makes the Harringtons 102 such a great place for a relaxing stay. The Harringtons 102 is a popular place to stay in the Hobart CBD because of its wide range of hotel facilities, central location and friendly customer service. Travellers who choice to stay in these budget Hobart CBD apartments will find themselves within close proximity of everything that the city has to offer. The Graham Apartments provides a range of studio, one, two and three bedrooom fully self contained apartment accommodation in New Town. The apartments and studios are beautifully maintained and continually being developed. Ideally situated in a great city location the Graham Apartments is within easy reach of all the major attractions that Hobart has to offer. This along with the many guest facilities like child minding, direct internet access, disabled facilities, faxing facilities, free car parking, guest laundry, tour desk, bbq facilities, garden, baby cots available for families, babysitting service and daily housekeeping is what makes the Graham Apartments such a great place for a relaxing stay. Ideally positioned only a short distance from the Graham Apartments are lots of popular destinations, as well as interesting things to see and do such as the Cadbury Chocolate Factory, Cascade Brewery, Southern Wineries, Mt Field National Park, Tahune Forest and Airwalk, Richmond Village, Port Arthur, Mt Wellington and the Salamanca Markets. Affordable four star luxury accommodation in the Hobart CBD, Tasmania. The Fountainside Motel Hotel is conveniently located close to the Hobart airport, the Hobart city centre, the exotic Salamanca market and is only a scenic 40 minute drive away from Port Arthur. Book now to experience the delightful atmosphere of Fountainside, with its luxuriously appointed motel suites, excellent facilities and its superb international a la carte Restaurant and Bar, open for 24 hours each day. Looking for one of the best value budget hotels and motels in the heart of the Hobart CBD? The Hobart Midcity Hotel offers cheap and affordable studio, twin, double, triple and superior hotel rooms in the Hobart city centre. The Hobart Midcity Hotel is well located in Hobart CBD, meaning that it is close to everything that the city has to offer. As well as this the property also has numerous guests facilities and services including bar area, free car parking, guest laundry, lift, restaurant, room service, tour desk, airport shuttle and 24 hour reception. Rydges Hobart offers 4 star boutique hotel accomodation where the charm and grace of the old is in harmony with the polish of the new. Rydges Hobart?s heritage listed buildings and antique suites capture the essence of historic Hobart. 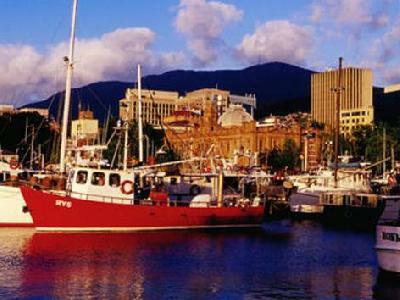 The Rydges Hobart is well located in Hobart CBD, meaning that it is close to everything that the city has to offer. As well as this the property also has numerous guests facilities and services including bar area, business centre, conference centre, free car parking, guest laundry, restaurant, room service, outdoor swimming pool, tour desk, BBQ facilities and 24 hour reception. Hobart Apartments are situated an easy distance from the CBD, and provide spacious apartment accommodation during your visit to Hobart. Free off street car parking is available. Visit Salamanca Market, Battery Point, Moorilla Winery and who can resist Cadbury's Chocolate Factory. The Hobart Apartments is well located in Lutana, meaning that it is close to everything that the city has to offer. As well as this the property also has numerous guests facilities and services including direct internet access, faxing facilities, free car parking, guest laundry and baby cots for hire. The Blue Hills Motel ( formerly the Best Western Blue Hills Motel), offers 3.5 star budget, clean and comfortable convenient accommodation.only a stroll away from every attraction in the city of Hobart. Staying at the Blue Hills Motel in Hobart allows you to make the most of the many guest facilities at this affordable property, including the direct internet access, faxing facilities, free car parking, guest laundry, room service, tour desk, baby cots for hire and daily housekeeping. The City View Motel is the perfect location for your next visit to Hobart. This discount Hobart accommodation offers 32 well appointed 3.5 Star non smoking motel rooms. The City View Motel is situated five minutes from the Hobart CBD, Salamanca Markets and 15 minutes to the airport by vehicle. No matter the reson for you travel, business or leisure, the City View Motel provides discount accommodation in a great Montagu Bay location. It also features a wide range of modern services such as bar area, direct internet access, faxing facilities, free car parking, guest laundry, restaurant, tour desk, BBQ facilities, airport shuttle, baby cots for hire and daily housekeeping. Apartments on Woolmers ( formerly the Leisure Inn Woolmers Inn), is ideally situated in the charming harbourside suburb of Sandy Bay, close to the excitement of Wrest point Casino and five minutes to historic Battery Point, Hobart CBD, Salamanca Market, Sullivans Cove, Wrest Point Casino and the highlights of southern Tasmania. No matter the reson for you travel, business or leisure, the Apartments at Woolmers provides discount accommodation in a great Sandy Bay location. It also features a wide range of modern services such as direct internet access, disabled facilities, free car parking, guest laundry, garden and airport shuttle. The Waterfront Lodge Motel provides a range of 3.5 star stylish hotel motel and studio apartments accommodation in a fantastic, absolute waterfront position in New Town Bay. Staying at the Waterfront Lodge Motel in Hobart allows you to make the most of the many guest facilities at this affordable property, including the outdoor swimming pool, tour desk, BBQ facilities and garden. The Waratah Hotel provides travellers with comfortable and budget accommodation in the heart of the vibrant Hobart CBD within easy reach of the many Hobart attractions. This delightful, modern and spacious hotel accommodation is ideal for the budget conscious backpacker looking for hostel accommodation with extra privacy, holiday makers looking for centrally located B&B accommodation & corporate business traveller requiring affordable accommodation in the heart of the Hobart CBD. This budget hotel features a variety of rooms that are designed for maximum comfort, as well as great amenities like lounge bar, direct internet access, free car parking, guest laundry, restaurant and daily housekeeping. With lots of interesting and exciting things to see and do in and around Hobart guests who choose to stay at The Waratah Hotel will be well positioned to see them all. This budget property provides business and leisure guests with fully self contained apartments that are spacious and well equipped, as well as great hotel facilities that add to your accommodation experience. The Hobart Cabins and Cottages provides you with a variety of budget self contained cabins, cottages and holiday homes delightfully situated on 3 acres of magnificent park like gardens. With easy access to all of the major tourist attractions in the Hobart region the Hobart Cabins and Cottages is the ideal place for your next budget accommodation. It also features numerous guest services and facilities including direct internet access, disabled facilities, faxing facilities, free car parking, guest laundry, tour desk, bbq facilities and garden. With convenient access to everything around Hobart due to its central location the Hobart Cabins and Cottages offers travellers a range of hotel accommodation close to Salamanca Place, MONA and the Cadbury Factory Visitors Centre, Mt Wellington, the historic town of Richmond, river cruises, golf courses, Cascade Brewery tours, jet boat rides and Tasmania's best seafood by the wharf.